We had thee best snow day!!! 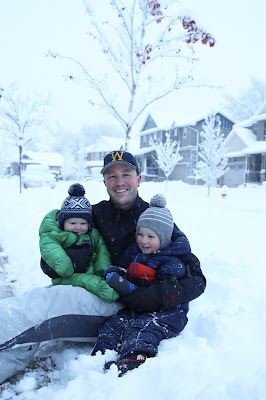 On Monday at 7am, Liam woke up and rushed out the front door to see 11 inches of fresh snow on the ground, and it was still falling like crazy! The roads were a disaster, so Conor decided to work from home and enjoy the day with us! The sun had yet to come up, but our whole family was outside taking in our wonderland. Shoveling. 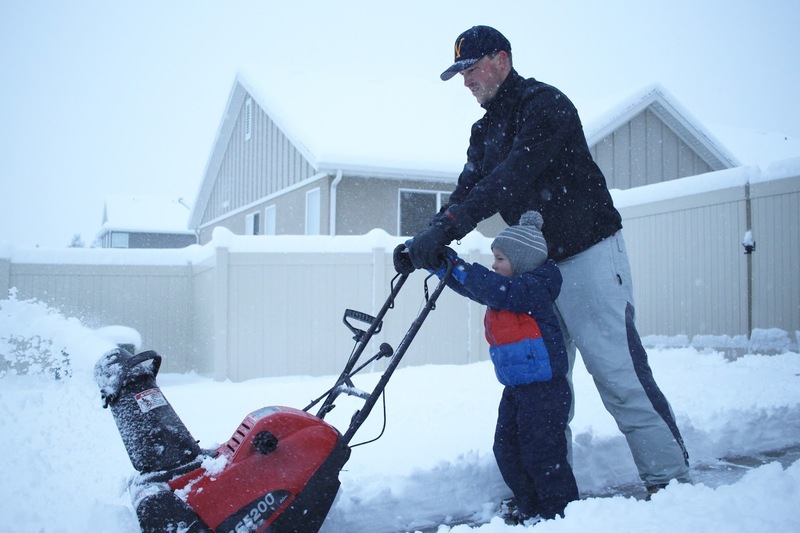 Snowplowing. Sledding. Snowman making. 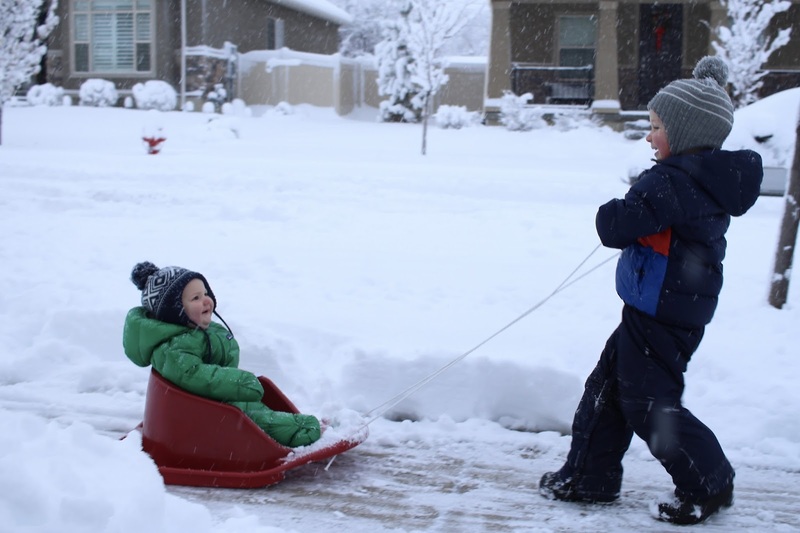 The highlight of the morning was watching the joy on both of my boys' faces as Liam pulled Finn around in the sled. He was gentle, yet still made sure to give Finn quite the ride! It is quite the effort to get them both dressed to head out in the snow, but the payoff is so worth it. Especially since my little outdoorsman will stay out for hours at a time! Midday, we took a little break from all the snow to sneak in some naps (just Finn & I), and get some homemade chili simmering (Conor & Liam). Chili has become one of our snow day traditions! Then on a whim, we decided to join in on a Candy Cane Hunt!!! 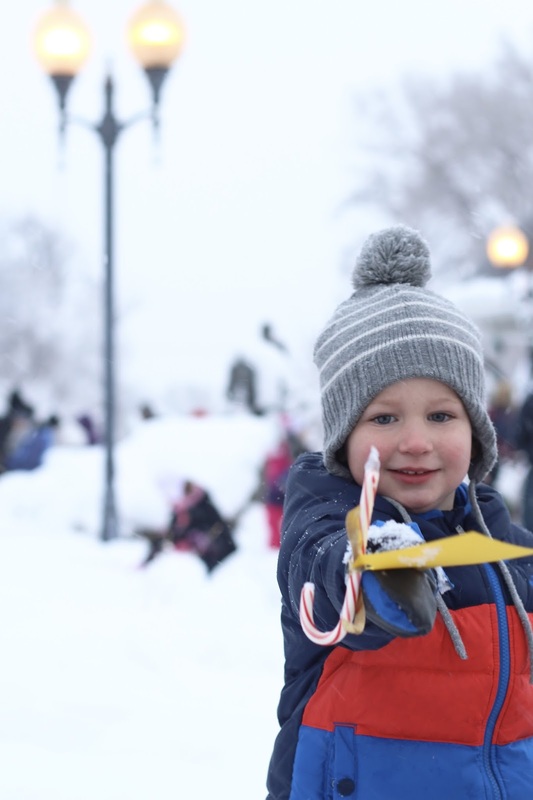 The park was covered in 2,000 candy canes, & Santa Claus arrived on a firetruck for a visit. I have no idea how this was our first ever candy cane hunt, but it will surely not be our last. I think next year I may organize a small one in our own neighborhood! It continued to snow all day and through Monday night. Overall we received about 1.5 - 2 feet of snow in just two days. Everything has been blanketed in white, and it is absolutely beautiful! The temperatures are supposed to stay cool, so we don't have to worry about it melting anytime soon. Plus, there is more snow in our forecast. Looks like we will most definitely be having a white Christmas. I love how the snow makes everything feel a bit more festive & cozy! Plus, now we can hit the mountains and get Liam back on his skis!!! This is the best post!!! 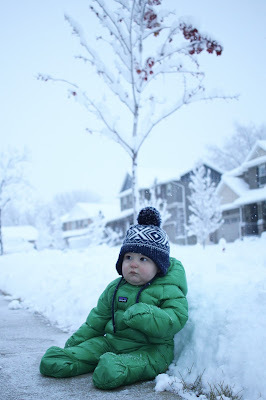 Finn in his green snow suit is a bit much for me to handle! Love it! But then, Liam pulling Finn in the sled?! How does your mama heart handle?! So sweet! Both kiddos are clearly beaming!! Also, tell me a bit more about this candy cane hunt...is it just like an Easter hunt but with candy canes on the trees? 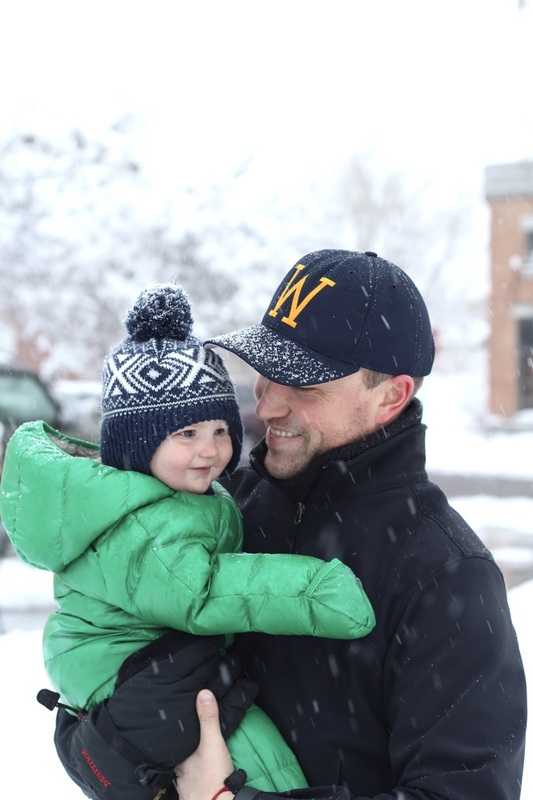 Holy smokes - best snow day ever. I'm generally not a snow fan, but this sounds like a little slice of heaven. A candy cane hunt?! Brilliant. I may want to borrow that for Christmas with all the cousins. A huge candy cane hunt!!! There seem to be some really great kid activities where you live! 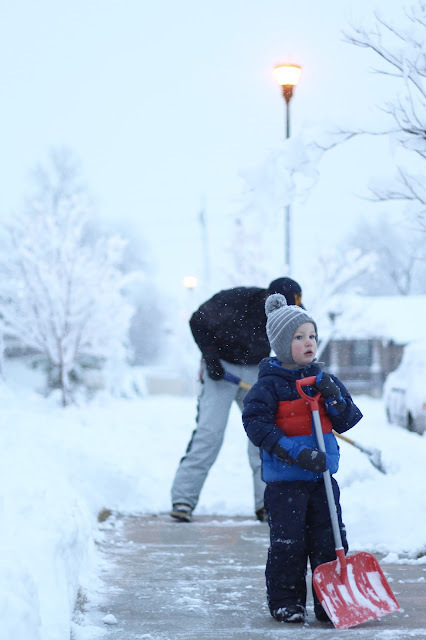 Hooray for a fun snow day- sounds perfect! OH your pictures look so beautiful and they make me want to move out west. All the snow is gorgeous and it sounds like so much fun to play in together. 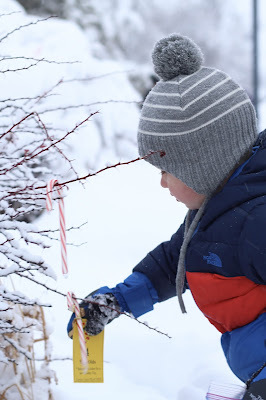 The candy cane hunt is tooooo cute! Best. Day. Ever. Love your chili tradition and you can just see the joy radiating from the boys faces! Yay for a white Christmas! So beautiful!! I love snow and miss it since we live in NC where it doesn't snow much. We get one good snow a year. I'd love a white Christmas but I'll survive! Looks like th boys had a blast! That looks like the best day for kids and adults alike! And of course, now I really want chili! Would Conor have normally gone in with 11 inches of snow? Since we never have snow here, I'm not too familiar with what's considered appropriate for missing work/working from home because of snow. What a great day even if it wasn't expected, I think those are the best days honestly. The ones you're least expecting. So beautiful! We've been having a MILD winter here in WI & to tell you the truth, these pictures make me want snow. I mean it's not really Christmas unless it's a white Christmas. That candy cane hunt is SO COOL!!! I've never heard of anything like that, maybe because it doesn't snow where I live?, but that looks like SO much fun!! You guys have got to do that again next year! Glad you are enjoying all the snow you're getting! 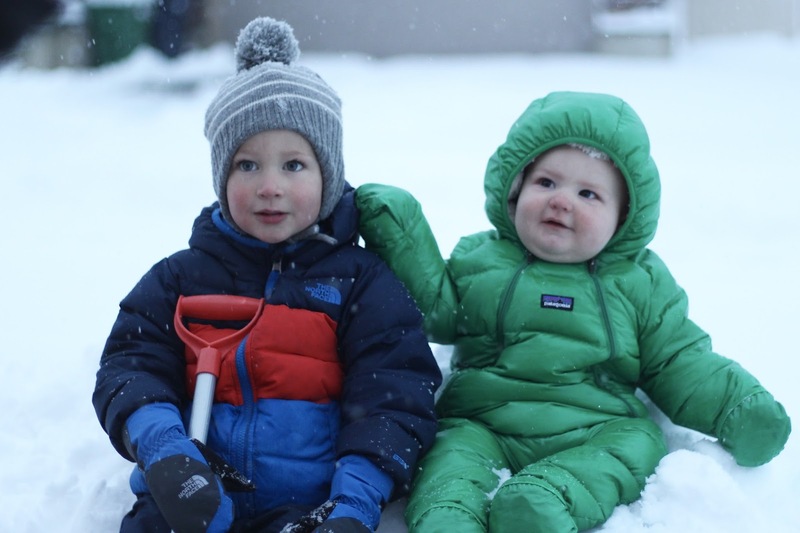 Finn looks SO stinkin' adorable in that little snow suit and that picture of Liam pulling him on the sled is pure perfection! This is so awesome! I love Finn in that green snow suit! He looks like a caterpillar! And I can't get over how much Liam looks like you and Finn looks like Conor. Awesome photos! I want SNOW!! snow days are the best!! especially the first big one! the candy cane hunt sounds like a blast!! Ahhhh, this takes me back to the "good ol' days." What a perfect snow day! The pictures of the snow are so pretty!